It just reminds me... ...Ron Millonario 15. Thats all I can say. :-) Very "spicy", dark, long taste. Interesting! Very nice rum! It reminds me Diplomatico. Very nice rum, sweet, chocolade, spices, smooth.... long aftertaste. My best rum This is the best rum, I ever tasted. But still, looking for others to taste. Never beaten so far. Wonderful You cant regret to buy this excelent rum. Dark color with nice aroma and very complex chololate flavor. On of the best! Very interesting rum Semi sweet, undescibeable tase and nose... more like flower and nutmeg nose and taste. Not for everyone. Classic This rum is well known. But, for me, it is not that good, as everyone says. 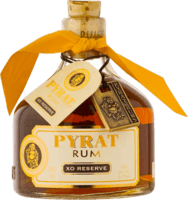 I had better pieces thhan this, but still, this is a one good rum! This one is very good One of my favorites. It really taste and smell, like raisins. It´s sweet and delicious. Quite different from other rums. Good, but not that good... Good rum, but there is nothing "extra" in it. I dont even remember its taste. This rum has no "signature" for me. But very drinkable. Good, but not that good. This rum is quite nice. I think, it is average quality, for sipping. But I would not recommend it. There are much better rums. Good for mixing I like bacardi in cola more, than Morgan. I am rating this as mix drink, not as a siper! Good For a spiced rum, it taste good. Not a quality dark (aged) rum, but quality spiced rum. You should really try it. Didnt stick, in my mind I would like to taste him one more time. But when I tried him, I didnt like it. Maybe I will get hand on it sometimes later and change my opinion.